Consider This questions have been added at the end of worked examples. These questions have been written to be conceptual in nature and often ask students to extend their understanding beyond the focus of the worked example. Key Concepts have replaced the end-of-chapter summaries. These are presented in outline form and can be used by students as a guide for the most important ideas discussed in the chapter. Concept Review multiple-choice questions have been added to end-of-chapter questions and problems. Most students enrolled in an introductory chemistry course will take multiple-choice exams, so these questions provide them with an opportunity to get some practice. The conceptual nature of these questions also helps develop deeper understanding and critical thinking skills. After each concept review question, there is a follow-up question that provides additional practice at analysis of multiple-choice responses. Revised Periodic Table Since the third edition of this book, two new elements have been named: flerovium and livermorium. A few atomic weights have also been revised by IUPAC. 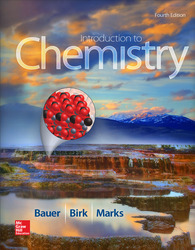 This textbook takes a conceptual approach, teaching the chemistry first and showing students how to use the math with the chemistry. It is regarded as having the best art program in the market. A conceptual understanding of chemistry requires students to visualize molecular-level representations of macroscopic phenomena, as well as to connect macroscopic and molecular-level understandings to symbolic representations. To help students connect verbal descriptions to molecular-level representations, this book has an extensive art program. You'll notice many examples of zoomed art where pictures or other macroscopic images have close-ups that show the particular phenomena at a molecular level. Math Toolboxes have been reworked, expanded, and now include accompanying end-of-chapter problems. To help students easily reference Math toolboxes, toolbox icons have been added to the text margin which will point students to the appropriate review material. The authors believe that the best approach to incorporating math involves development of associated math on an as-needed basis with emphasis on concepts that problems are trying to illustrate. This text integrates need-to-know mathematical ideas that are important to chemists into conceptual discussions. Thorough math reviews are provided in math toolboxes that are referenced within appropriate sections of the text and placed at the end of the relevant chapter. LearnSmart™. This adaptive diagnostic learning system, powered by Connect and based on artificial intelligence, constantly assesses a student's knowledge of the course material. As students work within the system, LearnSmart develops a personal learning path adapted to what each student has actively learned and retained. This innovative study tool also has features to allow the instructor to see exactly what students have accomplished, with a built-in assessment tool for graded assignments. Applications – Because we know how important it is for students to apply chemistry to their world, we have added or expanded, especially medical and environmentally related applications throughout the text, marginal notes, worked examples and end-of-chapter problems. All chapters begin with a scenario involving students in real-life situations. The problem-solving approach used in this text is supported by worked example boxes. Problem solving in chemistry is much more than algorithmic number crunching. It involves applying principles to solve conceptual as well as numerical problems. Conceptual problems are those that require students to apply their understanding of concepts instead of applying an algorithm. This text emphasizes the underlying concepts when discussing numerical problems within in-chapter worked examples. Many end-of-chapter problems also emphasize conceptual problem solving. Richard Bauer completed his B.S. in chemistry at Saginaw Valley State University (Michigan) and his M.A. and Ph.D. in chemistry education at Purdue University. He is currently the faculty head for science, mathematics, and social science at the Downtown Phoenix Campus of Arizona State University. As general chemistry coordinator on the Tempe campus, Dr. Bauer implemented an inquiry-based laboratory program. He has taught introductory and general chemistry courses for more than 25 years as well as a methods of chemistry teaching course. Dr. Bauer enjoys the diversity of students enrolled in introductory chemistry and is interested in student visualization of abstract, molecular-level concepts; teaching assistant training; and methods of secondary-school chemistry teaching. James Birk received a B.A. in chemistry from St. John's University (Minnesota) and a Ph.D. in physical chemistry from Iowa State University. He currently is Professor Emeritus of Chemistry and Biochemistry at Arizona State University. Dr. Birk began his academic career at the University of Pennsylvania, where he was appointed to the Rhodes-Thompson Chair of Chemistry. Dr. Birk's teaching responsibilities have included general, introductory, and inorganic chemistry; chemistry for engineers; methods of teaching chemistry; and graduate courses on inorganic reaction mechanisms, chemical education, and science education. He has received awards for Distinction in Undergraduate Teaching and for Teaching Innovation, the National Catalyst Award, and the President's Medal for Team Excellence. He has been a feature editor for the Journal of Chemical Education. Dr. Birk's research has focused on visualization, inquiry-based instruction, and misconceptions (chemistry concept inventory). Pamela Marks received her B.A. in chemistry from St. Olaf College and her M.A. in inorganic chemistry at the University of Arizona. She currently is a principal lecturer in the School of Molecular Sciences at Arizona State University, where her main focus for the past 22 years has been teaching introductory chemistry, general chemistry, and chemistry for engineers. Professor Marks has been involved in improving inquiry-based learning in the general chemistry program and recently modified her introductory chemistry course to a flipped classroom format. She also has taught in the general chemistry program at the College of St. Benedict and St. John's University in Minnesota. Previous education publications include a multimedia-based general chemistry education curriculum.